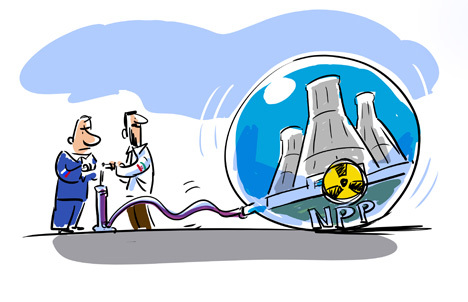 In early November, Russia and Iran reached a new agreement for the development of Iran’s nuclear power industry. Russia and Iran signed a series of documents providing for the construction of eight nuclear power units along with a specific contract for the construction of two power units at the already operating Bushehr nuclear power plant. Overall, this is one of the biggest deals to be signed on the world nuclear market in recent years. The value of the whole package of projects is estimated to be worth tens of billions of dollars, given that the price of building one nuclear power unit on the world market varies between $5 billion and $7 billion. The arrangement will not only generate massive profits for Russian state nuclear energy corporation Rosatom, but will also strengthen Russia’s position in the Middle East. According to preliminary estimates, thanks to the deals, Iran may eventually produce a minimum of 10 gigawatts of energy from nuclear power. This estimate includes power generated by the first power unit at Bushehr. As a reference, Russia currently generates 25 gigawatts of energy from nuclear power. With the agreement, Moscow and Tehran have sent a clear signal to the international community that despite a difficult political climate, the two countries are moving their relationship forward. The construction of these new nuclear power generation capacities could make Iran an exporter of electricity to the countries of the Persian Gulf, where there is an ever-increasing demand. The entire project for the construction of new nuclear power units in Iran, including equipment and fuel supplies, will be carried out under the supervision of the International Atomic Energy Agency (I.A.E.A.) and will fully comply with the regime of nonproliferation of nuclear materials, as was the case with the construction of the first power unit at the Bushehr plant. Russia has much to gain from the new agreement in both the short and long term. The agreement provides work for Russia’s nuclear machine factories and engineers, who will have to supply all the equipment for the power plants throughout the construction period. In addition, the nine power units, including Bushehr-1, will also be buying Russian nuclear fuel for the foreseeable future. The provision of fuel alone will mean a constant inflow of revenue into Russia for many years. The profit from the sales of fuel is also estimated to be tens of billions of dollars. More importantly, the deal, like the agreement to finish the construction of Bushehr in the first place after it was abandoned by Germany, gives Russia a place from which to grow its presence in the Iranian market once sanctions on Tehran are lifted. Iran has been under some form of sanctions since its 1979 revolution, and additional sanctions were imposed in 2006 after the country refused to curtail its nuclear enrichment program. Today, sanctions are in place against Iran’s oil and petrochemical industries, banking and insurance services, shipping and some online services such as Web hosting. Many observers, however, believe that the country will soon be allowed back into the global economic community. The U.S. and the E.U. lifted some sanctions against Iranian oil in January after Iran stopped enriching uranium past 5 percent, and are expected to lift more restrictions before the end of 2014. In anticipation of the re-opening of the Iranian economy, businesspeople from all over the world are flocking to Tehran. The nuclear agreement gives Moscow a boost. This is especially important since once the country is open for business, Russia will face stiff competition from China, Japan and Europe in providing goods and services. Iran, for its part, will also reap multiple benefits. The country is diversifying its energy policy. Expanding the percentage of domestic energy provided by nuclear power will free up oil and gas to sell on the world market. Additionally, the project will provide Iran with thousands of jobs for years to come. The plants will require large teams of construction workers along with specialized architects and engineers. Another plus — the Iranian scientists and engineers who will build and work at the power plants will learn from the experience of their Russian colleagues. Russia has another reason for making friends with Iran. Iran has the world’s second-largest oil reserves. Russia has only the seventh-largest. Moscow is concerned that once Tehran is again free to sell its energy resources on the world markets, the two countries will be competing for contracts in Europe, China and India. By dealing with Iran now, Russia hopes that any future sale price of oil and gas will be agreed upon with Moscow in advance. The arrangement creates a mutual interdependence between Russia and Iran economically and geopolitically at a time when both countries need more friends in the international community. Russia wants to show the rest of the world that it is capable of working with partners on a project of global interest; Iran wants to prove yet again that its nuclear enrichment project is a peaceful one. If restrictions against Iran are indeed lifted this fall, the Russian side could be hopeful that economic sanctions against it could be lifted as well. Andrei Retinger is an independent expert who has written about the Russian nuclear industry for more than 10 years.